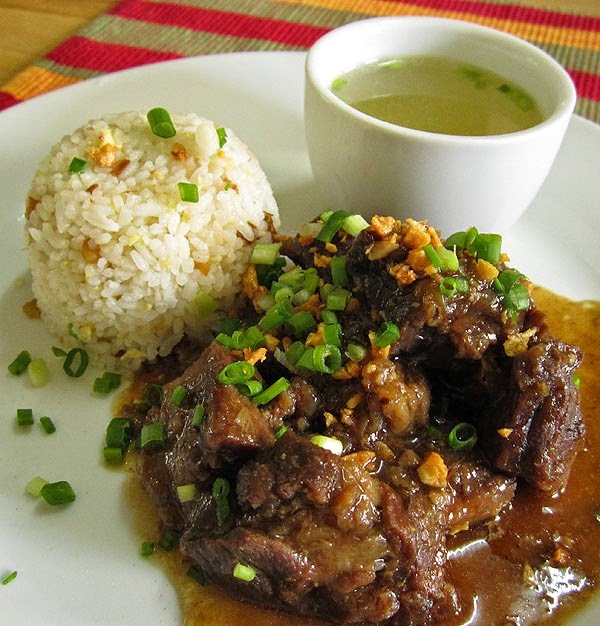 Beef pares is a heady beef stew, fragrant with star anise. Traditionally made with brisket, I prefer to use shin (shank or gravy beef) as it is less fatty, but stays moist because of the connective tissue which turns meltingly gelatinous with long cooking. Don’t make the mistake of using a lean cut such as blade (chuck) – it will end up dry as old boots. 1. Put the beef, soy sauce, pepper, sugar, chopped onion and star anise in a large saucepan with 4 cups water. 2. Bring to the boil, then reduce the heat to low and simmer for 1 hour, or until the meat is tender (this will vary depending on the cut used). 3. Allow the meat to cool in the liquid, then lift out the beef and reserve the stock. 4. Heat the oil in a large heavy-based frying pan over low heat. Add the finely chopped onion and garlic and cook until soft. 5. Add the drained, cooked beef and cook, stirring, for a few minutes, then add the reserved stock and simmer until the liquid has thickened and reduced. 6. Garnish with the spring onion and serve with fried rice and soup.